This is the cast-bronze sculpture greeting library patrons at the Windsor Park branch. It’s called “Reading Between the Lions,” by Paul Bond. We hadn’t been to this branch for a while and were glad we had consulted a map before heading for it, since it’s not that far from the old Mueller airport and there are several dead-end streets nearby. I still think of it as a “new” branch, even though it’s now more than a decade old. It seems more spacious than some of the newer branches, and it’s very busy, as they all are. Windsor Park has a fine collection of mysteries and thrillers, a substantial collection of jazz CDs, and ample accommodation for computers, both those at the branch and those brought by patrons. We found some fine DVDs from the Golden Age of Mexican movies (those who love them should remember that the Mexican American Cultural Center is showing a series of comedies starring the great Cantinflas, by the way). This is one of the branches that welcomes magazines for exchange. Many of ours were gone almost before we set them down. South Austin Vampire, by Russ Hall, is on the new-books shelf at the main library. “Vampire” is something of a red herring, “South Austin” has nothing much to do with the story, “Austin” is a somewhat nebulous presence in the book. We read of South Lamar “Street” but we also find references to Don Walser and Hut’s, here in the “Live Music Capital of America.” There are passing mentions of “Matt’s El Ranchero” and of the late, lamented Roy’s Taxi, described as having lime green [not!] and red cabs. The most clever allusion is to one “Dutch Hitchcock” (read “Butch Hancock“), complete with a mention to the long defunct real-life gallery and shop on Brazos Street called Lubbock or Leave It. The blurb on the flap of the dust jacket describes a trail that goes winding all over town, from fortune teller to music performance and recording venues to neighborhoods of wealth and the seats of political power. The protagonist is one Travis, the blue-eyed Indian. I’m not sorry that I read this, but I recommend it only to the curious. There’s no mystery here. The North Village branch still feels brand-new, as though it opened only yesterday. It is on Steck, but seems very quiet and peaceful despite all that, so that any performance on the little outdoor stage depicted in the accompanying collage probably will not be drowned out by passing traffic. Areas seem to be better arranged than they are at the even newer Twin Oaks branch, so that there’s no constant apologizing for stumbling over or backing into other patrons, as there is at TO. The natural light everywhere indoors illuminates without glare. The acoustics are not noticeably reverberant and there seems to be ample damping down any possible echo effect. The staff is very pleasant, and the ergonomics of the areas set aside for the library’s own desktop computers and for patrons’ carry-ins were excellent. Ample outlets are available at convenient heights for all. There’s a sort of wheelbarrow by the door, used as a magazine exchange. Restrooms are for men, women, and “family.” More sinks would have been useful and a patrol, also, to pick up litter scattered around. This library has a good-sized children’s area and also seems to offer a selection of Korean movies on DVD. Although the City bills North Village as a “library of the future,” a bit more of the past, in the form of more books, would be an improvement. Every branch of the Austin Public Library is different, and we try to visit them all. This is our first inspection of the newest version of North Village. It’s a fine building and conveys an air of conviviality and spaciousness. Three bus lines serve this location. 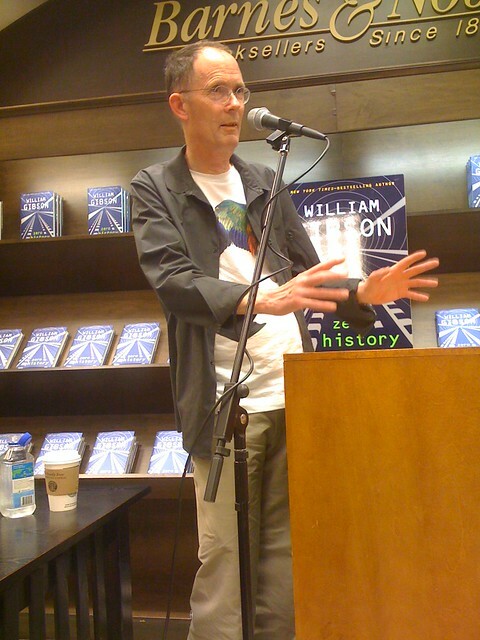 William Gibson made a stop at the Arboretum Barnes & Noble last night to promote his new book, Zero History . He read from Chapter 16 of the book and took some questions from the audience, some of which were enlightening. Not sure if he was just using it as an excuse, but he cut it short because the feedback from the sound system that the store provided was annoying him. I was disappointed because I was enjoying his answers. Someone asked him about a recent short story and why he didn’t do more of them. He answered that there’s no money in them these days and that he feels like he’s got a limited number of ideas and any that turn into short stories take away from the pool that he can use for novels. He also discussed his admiration for Inception. During the signing, the guy in front of me had him sign his electronic copy of Zero History on an iPad. That was a first, but fitting, I suppose, for the author who is credited with coining the term “cyberspace”. You can follow him on twitter @GreatDismal. He’s pretty active when he’s not busy writing. Zero History is the third book in a series. The first two were Pattern Recognition and Spook Country . I’d recommend starting with Pattern Recognition. I’ve really enjoyed the first two and am looking forward to reading the third. Perhaps that judgment is unfair. It’s better to say that the outdoors is a great improvement over the parking lot surrounding the old branch in the strip shopping center. Handsome lanscaping has replaced most of the paved area that surrounded the old post office that preceded the new library branch at this site. There’s shady seating outdoors with comfortable chairs and capacious tables. The picture here shows a portion of the outdoor amphiteater, which is a pleasing touch. Additional snaphots show more about the surroundings. Indoors, the library seems to have fewer books, both for adults and for children. Space is ample at computer work-stations, and there are many; space is cramped for those trying to see books on the shelves or to select DVDs or CDs to borrow. Among the bookshelves, there’s room for one, not-large person in each aisle, with not much, if any, space for one library patron to pass another. Where CDs and visual media are stored, when a tray or drawer is open on one side of a row, there’s no room to open one on the other side. Today, there was a line at the service desk, and only two of three self-service devices were working. Meeting rooms for community use seem to be pleasant. The restrooms are near the entry. I hope that this does not become one of the branches where patrons must request a key to use them. The magazine-swap has survived. There’s much availability of natural light. The acoustics, however, are very busy, and I noticed that some people were having difficulty understanding what others were saying. The new branch is in a much better location for those west of Congress than the old one was, but the old one was at the crossroads of close-in South Austin. We’re all happy to benefit again from a South Austin branch. The new one took much longer to be ready than expected, and the old one was closed for months before this one finally opened, last weekend. Here’s what the City says about the new Twin Oaks branch library. As nice local pre-event to the upcoming SXSW insanity starting Friday, I attended a 20th anniversary panel on the secret service raid of Steve Jackson Games last night at Independence Brewing. If you’re unfamiliar with the landmark case in cyberlaw, Steve Jackson maintains a page about the case on his company’s web site and Bruce Sterling’s book, The Hacker Crackdown, was written in 1992 and has been available as an ebook (also here) since 1994. The raid led to the founding of the Electronic Frontier Foundation. 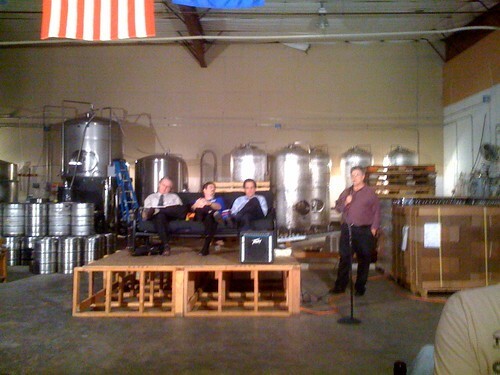 The panel was hosted by EFF-Austin (The original idea was to have local chapters of the EFF, but that never panned out. The Austin chapter has continued on independently since then. ), attended by Steve Jackson, Bruce Sterling & Pete Kennedy, and moderated by Jon Lebkowsky. The panel went over the basics of the case and why it’s important, followed by a Q&A session. Sterling became pretty impassioned during the talk. He said that he’d thought he was over his anger with the issue, but the two hour panel brought it all back. Pete Kennedy was very measured. Steve Jackson looked back on it with a bit of humor, but 20 years ago, it nearly killed his business. Kennedy brought up the interesting trial detail that the government’s main basis for the sealed search warrant executed on SJ Games was a local security professional affiliated with UT who wouldn’t corroborate half of the things that the federal government alleged. Sterling thinks that the Chicago US attorney at the time, William J. Cook, had career ambitions that made him reckless. He also brought up the Obama administration’s current cyber security czar, Howard Schmidt, served under Cook at the time of the raid. Sterling also contends that we missed an opportunity at the time to be the standard for law on the Internet and that things are much worse now. As a aside, I’m kind of a beer snob and haven’t been a very big fan of the Independence Austin Amber or Bootlegger Brown, but I had the opportunity to try their Stash IPA last night and liked it quite a bit. I’m partial to IPA’s anyway, but still. I think it’s only available on draft right now, so check with your local beer pub. It sounds like EFF-Austin plans to become more active than it has been lately, so be on the lookout for more events from them. Terra Toys stocks commercial-free Valentine cards, free of licensed characters: no Disney, no TV shows, just old-fashioned sentiment. We were too late to send away for reissues of vintage cards and didn’t have our usual luck this year finding old-fashioned valentines in Spanish. Terra Toys has been a magnet since it was one of the first new retail establishments in years to open its doors downtown on Congress, on the lower part of the Avenue that sported an array of bars catering to those who also rented mailboxes at the same places and would turn over their monthly VA or SS disability checks and then run a tab all month until credit ran out. Terra Toys survived there and seemed to thrive until one of the recurring real-estate booms demolished its premises. That’s when Terra Toys pioneered on South Congress, continuing to sell its little handmade wooden toys on wheels and expanding to offer one of the very best selections in town of books for children (still true) and then Dragonsnaps, selling clothing for children. Again the real-estate juggernaut charged through, and now Terra Toys is located at 2438 West Anderson Lane (445-4489; open at 9 am every day of the week but Sunday, when it opens at noon). Terra Toys still offers Steiff, Madame Alexander, kites, toy robots, dress-up clothes and hats, board games, construction toys, art supplies, activities, and much, much more. Don’t forget those showy cocktail rings sporting giant facted “jewels,” just three dollars. Most of the creatures on wheels and other handmade wooden toys from the old days went as presents, but I’ll never, ever give away my chicken on wheels or my wonderful floating battleship. Posted in Books, City Life, Entertainment | Comments Off on Terra Toys is tops! The idea of the Mayor’s Book Club is a little bit hokey. Some years I read the book selected and some years I don’t. I’d been passing this year’s by each time I saw it displayed at a library branch, but eventually my resistance broke bown and I borrowed it. You should, too. The various summaries I’ve seen don’t do Amigoland justice. It’s a fast read and an entertaining and good-humored one. I look forward to reading more by Oscar Casares, who teaches at UT. John Mackey, nearly synonymous with Whole Foods, is the subject of a long article in the New Yorker of January 4, with extended quotations from JM himself (“Food Fighter: Does Whole Foods’ C.E.O. know what’s best for you?” by Nick Paumgarten). We read about the WH origin story, with passing reference to Central Market. Although the writer draws out JM very well, he doesn’t have much, if any, success in coaxing others to talk about JM and WF on the record. I enjoyed reading the description of the fountain of chocolate and the brief passing reviews of prepared foods from those counters. Taking his place on a very short list, our own James McMurtry is named Most Valuable Rocker in The Nation of January 11. That is one category among the many in “MVPs of 2009” (byline John Nichols). Domy Books is a real feast for anyone who has eyes. Finish your holiday shopping for yourself and for those on your lists in one delightful stop. We concentrated on books and limited-edition works on paper, with a little side stop at the Poketo artist billfolds. Domy stocks the Charley Harper alphabet board books, not just for little kids. There’s an extensive selection of kidrobot and other art toys. It was easy to resist the oevre of Stan Brakhage, not a personal favorite (one viewing of Dog Star Man in a lifetime is quite enough for some), but his work is among the DVDs available. R. Crumb’s illustrated Genesis is also in stock. Russell, most affable and apparently the presiding genius of the place, was there to answer all questions. There are many surprises to be found on Domy’s shelves, a perfect example of serendipity at work. At Domy, all is available for inspection, not locked away, no matter how precious, it appears. Fiction is not overlooked (Dumas, Roberto Bolaño); nor is the instructional (how to make it at home; how to play dozens of card games). Do you need books that are photo souvenirs of ever-changing Austin, post cards, pocket calendars, unique greeting cards, journals to write in that distinguish you from the rest? Find them at Domy. Don’t go before noon, which is when Domy opens its doors seven days a week, but do go. Whole the more intrepid shopper in the household braved the crowds at Central Market, I tarried at Whole Earth Provision Company and found to my surprise that I was able to accomplish nearly every bit of gift shopping necessary for the remainder of the year, holidays and birthdays included. It’s easy to forget that Whole Earth is a great place to shop for children: clothing, games, Uglydolls, toys, and books. There are wonderful sets of wooden architectural building blocks. There’s also a copious yet very well edited selection of books meant to be read to and read by children. For adults, the books include recipe classics, travel accounts and guidebooks, outdoor how-to manuals, and many, many so-called coffeetable books to delight the discerning eye interested in architecture, travel, and much, much more. The 1,000-piece jigsaw puzzles include Charley Harper, Aubudon, and other stylish and intricate subjects. As always, those seeking aids, gadgets, and gear for the outdoor-person or the globetrotter will find examples of the latest ideas. There’s a world of footgear, headgear, clothing, jewelry, and more. And this is the place that may have the widest selection of “Keep Austin Weird” designs. Out-of-town visitors seem impelled to add to their KAW collections, no matter how many items they already possess. Whole Earth Provision Company is a very attractive all-in-one destination for the person who hates to shop (and the person who loves to). The word “eclectic” applies.